Next year’s proposed Pentagon budget includes more funding for a greater quantity of unmanned systems and associated technologies than any previous DoD budget in recent memory. In a new report, we break down the Pentagon’s drone spending plans. Here’s what you need to know. The Trump administration is proposing legislation that would grant government and law enforcement agencies greater authority to track and disable drones. 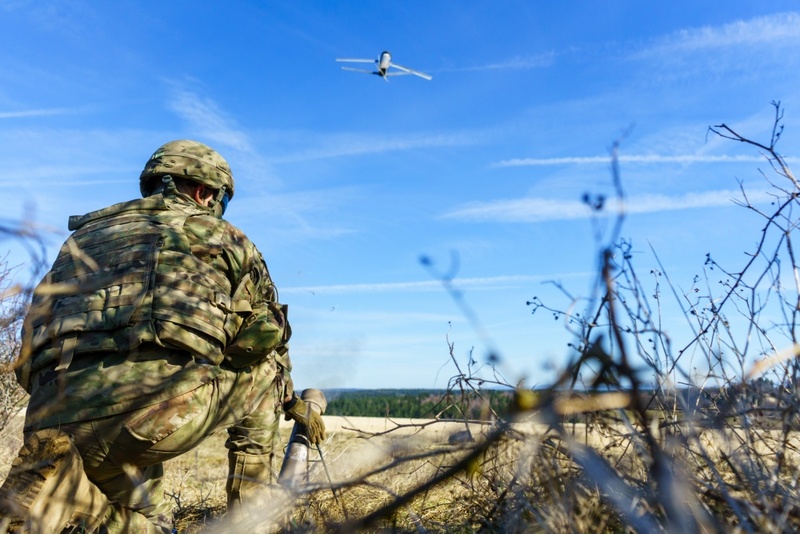 According to the Washington Post, the draft legislation would waive certain constraints on intercepting drones under existing electronic communications laws. For more on counter-drone systems, click here. According to the Washington Post, while reviewing footage of a CIA drone strike, President Trump reportedly asked why the agency did not target family members of the suspected militant killed in the attack. At the New York Times, Christine Negroni charts the emergence of university courses aimed at teaching students how to design and fly drones. Also at the New York Times, Christine Negroni looks at how cell phone carriers are exploring ways of using drones to provide mobile hot spots in disaster areas. At War on the Rocks, Cory T. Anderson, Dave Blair, Mike Byrnes, Joe Chapa, Amanda Collazzo, Scott Cuomo, Olivia Garard, Ariel M. Schuetz, and Scott Vanoort argue that a recent study on military attitudes towards drones does not correspond to the reality on the ground or in the air. At Aviation International Online, Vladimir Karnozov writes that Russia’s experience in the Syrian Civil War has convinced the Russian military of the utility of armed drones. At The Verge, Nick Statt writes that Skydio’s R1 drone offers a peek into the future of fully autonomous consumer drones. At Law360, Linda Chiem summarizes several legal cases and rulings that could impact drone regulations and operations. At the Diplomat, Franz-Stefan Gady writes that a new variant of the China Aerospace Science and Technology Corporation Caihong-5 could have significantly improved capabilities. At The News and Observer, Elizabeth Anne Brown profiles efforts in North Carolina to prevent drones from dropping contraband into prisons. At KTTS, Jace Larson and Scott Sherman look at how hackers are using drones to steal personal information. At Aerospace America, Jan Tegler looks at why the U.S. Nvy abandoned the idea of a strike drone and invested in a tanker drone instead. Meanwhile, at Business Insider, Ben Brimelow examines the different proposals submitted by defense contractors for the Navy’s MQ-25 tanker drone design. At the Los Angeles Times, Phil Diehl writes about several U.S. local law enforcement departments that are looking into buying counter-drone systems. At SportTechie, Joe Lemire looks at how a youth soccer coach in the U.K. used a drone to improve training exercises. At AOPA, Juan Plaza writes that NASA is using a subscale version of a Piper Cub aircraft in tests aimed at integrating drones into the national airspace.